While never a long-running success, the What If? series of comics has proven to be one of Marvel Comics’ most persistently published properties. From 1977 to 2015, the series has seen 12 different volumes devoted to the idea of exploring the alternate realities spinning out of classic Marvel stories. Some of them were fairly mundane, such as “What If Spider-Man had successfully convinced The Fantastic Four to recruit him and become The Fantastic Five?” way back in Amazing Spider-Man #1. Some of them were fairly strange, such was “What if Wolverine Traveled Back To The Time of Conan The Barbarian?” (SPOILER – Logan becomes King of Aquilonia and makes Red Sonja his queen. Always with the redheads, that Canucklehead.) Now, the company is reviving the concept again, with a new series devoted exclusively to Spider-Man stories set in divergent timelines. 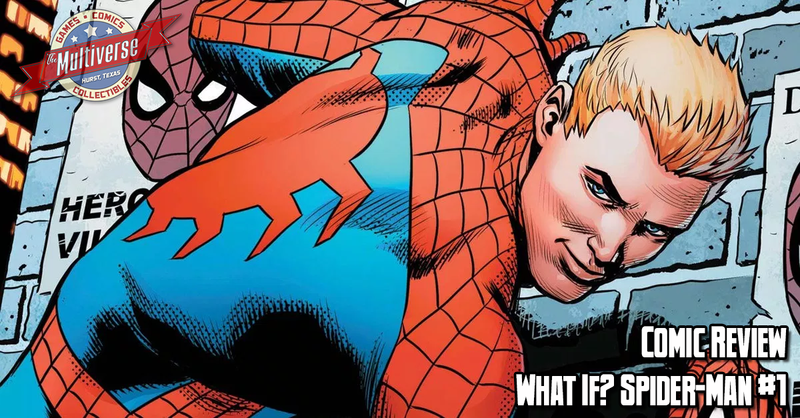 The first issue goes back to Spider-Man’s origins with a classic concept – What if Flash Thompson had become Spider-Man instead of Puny Peter Parker? The obvious answer is “Spider-Man would have been a total jerk.” It’s accurate, but that basic truism is taken in unexpected directions by writer Gerry Conway, who (if you don’t know the name) has more than a little experience writing Spider-Man. Thompson’s Spider-Man is a divisive public figure, but for completely different reasons. Armed with all of Spider-Man’s strength but none of Peter Parker’s compassion, Flash is a brutal bully of a vigilante whose actions scare the public. This is due largely to the pictures that Peter Parker takes of him in action and in spite of J. Jonah Jameson’s editorials about how Spider-Man is just the sort of decisive man-of-action the city needs. I dare not spoil where the story goes from there, beyond saying that Conway pays tribute to a number of classic moments from the Stan Lee/Steve Ditko era of Spider-Man while showing how those events were drastically changed by Flash Thompson being in the Spider-Man suit. I can note, however, that Ben Parker is alive and well in this reality, since Flash Thompson always saw himself as a hero in the making and didn’t hesitate to stop the runaway thief that would go on to kill Uncle Ben in the main Marvel Universe. It’s fascinating stuff if you’re a Spider-Fan and Conway handles it with style. The artwork by Diego Olortegui matches the writing in quality. Though a number of classic scenes are reenacted, Olrotegui maintains his own unique style while utilizing the classic layouts and blocking of Steve Ditko. The final effect is memorable, though the inks by Walden Wong seem thin at times and the colors by Chris O’Halloran often lack the boldness this story demands. It’s hard to gauge a series like What If? which often has a rotating team of creators. This means that the level of quality from issue to issue can vary wildly. As such, I can’t say that every issue of this series will be worth picking up in the future. This one, however, is definitely worth reading if you like classic Spider-Man stories. 7/10 What If? Spider-Man #1 releases on October 3, 2018!